When I heard about this book -- Where Treetops Glisten -- I most definitely wanted to read it. I've reviewed four of Sarah Sundin's books (In Perfect Time was the most recent), and I absolutely love how she writes World War II. Sundin is one of my absolute favorite authors. I recently read a WWII based novel by Cara Putnam that I really loved also. And I've read a few novels by Tricia Goyer. Although none of those actually took place during the Second World War, one (Remembering You) did have a lot to do with that time. Plus I love Christmas music. And I love music from the 40s. So I had to read this. This book covers the Christmas seasons of World War II. The Prologue, Winter Wonderland, is quite short, featuring Grandma Louise Turner who is trying to make Christmas happen in spite of the horror of Pearl Harbor. This introduces the family, and sets up the novellas to follow. Each novella features one of the Turner siblings, but this is family, so in Pete's story (the middle novella) we do learn more about "what happens next" for Abigail, and we get glimpses of "what happened before" for Merry. And Grandma shows up throughout the book. White Christmas (Putnam) takes place from October to December of 1942, and is centered on Abigail. Abigail's high school sweetheart had died at Pearl Harbor, and she is committed to not getting involved with anyone. She is attending college and working in a candy shop... and then she encounters someone who is in need of help. I'll Be Home for Christmas (Sundin) takes place in December 1943. This one is centered on Pete, who has been serving as a fighter pilot in Europe, but is home for a month before heading off to another assignment. He's clearly dealing with some post-traumatic stress. He runs into a little girl, returns her home to her mother, and the story develops from there. Have Yourself a Merry Little Christmas (Goyer) occurs in the Netherlands in December 1944. Meredith is serving as a combat nurse very near the front lines. She's trying to get over being dumped by her German boyfriend, who headed back to Europe when the US got involved in the war. She can't believe she was dating a German spy, yet she still finds herself looking at every German soldier comes through for medical help. The Epilogue, Let It Snow, Let It Snow, takes place on Christmas Day, 1945. This wraps up all three of the novellas quite well. I loved the book. Since I have read other books by all three of the authors, I did sense a shift in the writing style as I moved from one novella to another. It was incredibly obvious, though, that the three authors worked closely together throughout. The characters do not change from one novella to the next. No, that doesn't come out right. Of course they change, they are growing, the war is continuing, they are a year older as each novella opens. What I mean, though, is that there is no doubt that Abigail is still Abigail, even when written by Sundin or Goyer. And Grandma Louise is absolutely wonderful throughout the book. I loved this book, and it is going on my "to keep" shelf. 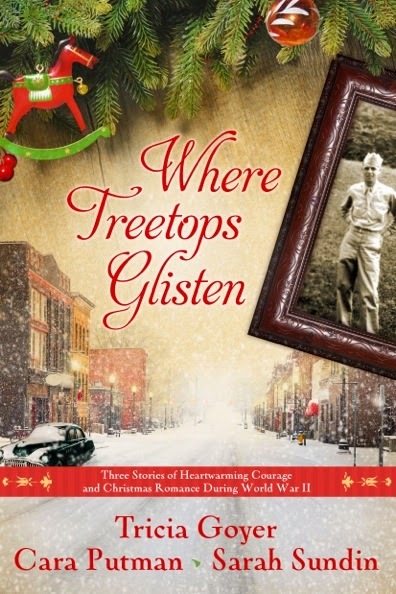 Go, check other LitFuse reviews of Where Treetops Glisten.